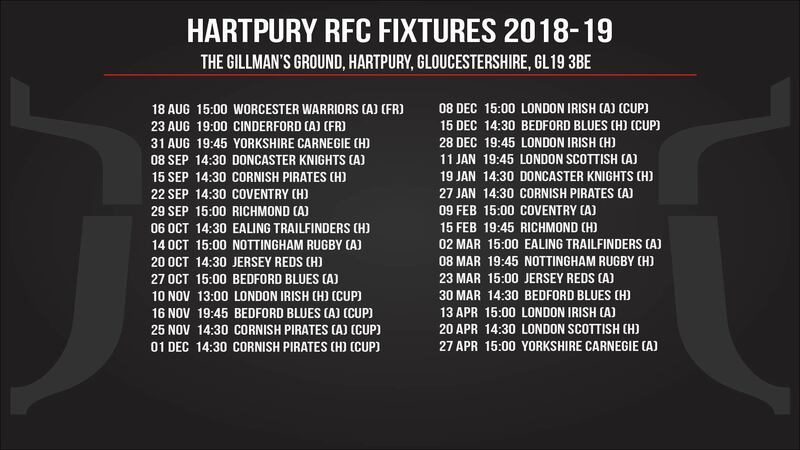 Hartpury can now confirm the schedule of fixtures for the 2018-19 season. You can access our full listing here. The fun starts in August with trips to Worcester Warriors, of the Premiership, and to National 1 neighbours, Cinderford, as our pre-season preparation. Greene King IPA Championship action also starts in August, with the news that our opening game – in which we host Yorkshire Carnegie – will now be played on the evening of Friday, 31st August, kicking off at 7.45pm. As previously reported, this is one of a number of Friday night games at the Gillman’s Ground in the coming season although, contrary to our most recent update, this does not include our home Championship fixture with Cornish Pirates which will now be played at the more usual time of 2.30pm on Saturday, 15th September. For the record, our other Friday night home fixtures will be against London Irish (28th December), Richmond (15th February) and Nottingham Rugby (8th March). For those of you planning to travel to support Hartpury on the road this season, we have Friday night games at Bedford Blues (16th November) in the Cup, and at London Scottish (11th January) in the Championship. We also have have Sunday trips to Nottingham (14th October) and twice to The Mennaye, in Penzance, for fixtures with Cornish Pirates on 25th November (Cup) and 27th January (Championship). Of course, the big change this season is the replacement of the British & Irish Cup with the new Championship Cup competition which will be staged in a six week block through November and December, before returning for the play-off stages at the end of the season. Hartpury fans will no doubt be pleased to know that there is no alteration to pricing in the season ahead, meaning that tickets will still offer excellent value for entertainment at this level. Match-day prices remain at £15 for a standard adult entry and £10 for concessions (OAPs and non-Hartpury students). As before, all under-16s and Hartpury students will be admitted free of charge! You can even bring the dog (on a lead, please).